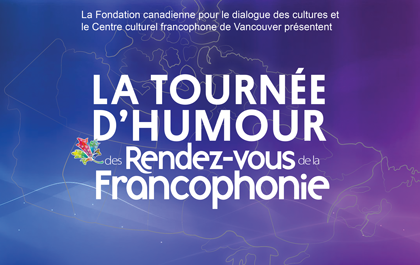 Organised in collaboration with the Rendez-vous de la Francophonie and the Canadian Foundation for Cross-Cultural Dialogue, this annual Francophone comedy night brings together acclaimed and up-and-coming Franco-Canadian talents, to delight the Greater Vancouver area with a memorable evening of comedy, in French. For the past ten years, a loyal following amongst metropolitan Vancouver audiences has grown in response to the line-up of hilarious artists, at times sarcastic but always just plain funny. Since its debut, many artists have come to perforn at this annual event: Anthony Kavanagh, Laurent Paquin, Boucar Diouf, Marie-Lise Pilote, André Sauvé and many more. **Stay tuned to discover this year's full line-up.